We’re thrilled to be featured in Lisa from Nourish For Life‘s beautiful new recipe eBook. Scroll for all the details and find out how you can win a copy (with some bone broth too!). 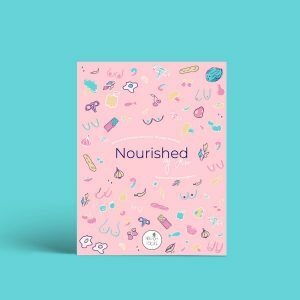 We’re delighted to announce that we’ve teamed up with Lisa of Nourish For Life and designer and illustrator Lauren Smyth as they release their beautiful new eBook (just LOOK at that cover! ), full of delicious recipes designed to help you balance female hormones through nutrition. Sadie’s Kitchen is also thrilled to be featured in the book – hint: you’ll find us in Granny’s Healing Chicken Soup! And it’s a project, not just designed to make you feel great but for a wonderful cause; all proceeds go to Safe Ireland a charity which supports females in abusive situations and helps them get back on their feet. To win a copy of ‘Nourished by Lisa – Balancing Female Hormones Through Nutrition’, plus a month’s supply of Sadie’s bone Both, head over to @nourishforlife_nutrition Instagram now or click the post above. Exciting News: You can now buy Sadie’s Kitchen on Amazon UK!